“Come on Blue” is what I heard, this guy was giving it to the ump, I thought this guy could be my first fan that I will interview for the Baseball in America Tour 2014, he would be the start. The very first of hopefully many characters that I will meet along the way. My hope was this guy would have an interesting story, he was sitting with a teenage boy, both were decked out in Auburn Tiger gear, so when he yells “Come on Blue” he is referring to the Tigers who were decked out in Orange and that is why I was confused. I walked up to them and introduced myself, Lonnie Burton was his name and he was at the game with his 14 year old grandson Noah who got out of school early to go to the game with his grandpa. Lonnie explained that he was a huge fan of all Auburn sports, especially football and especially this year since Auburn defeated Alabama in the Iron Bowl (http://www.youtube.com/watch?v=ZDjzJeWjfNA) click on the link to see the highlights if you don’t know what I am talking about. He explained that in Alabama that you have to declare basically at birth if you are an Auburn or Alabama fan, he has 4 brothers, 3 are ‘Bama fans and him and another brother are Auburn. It gets quite heated during the rivalry game if his brothers watch it together so in recent years they haven’t. Lonnie is 64 years old and lives in Fort Myers, Florida for the past 11 years and works in commercial refrigeration for Hillyork, he is originally from Birmingham, Alabama, right in the heart of enemy territory as he put it, he moved to Fort Myers because North Alabama was just too cold (quit laughing my Wisconsin friends) he has 5 kids and 1 girl, Noah’s mother and the first girl born in Lonnie’s family in 9 generations, (that is not a typo, 9 generations) Noah is 1 of 5 grandsons that Lonnie has, he doesn’t have a granddaughter, must not be in the DNA, Lonnie says. Lonnie says he really only likes college sports but does pay attention to the Carolina Panthers because of Auburn alum Cam Newton but that is about it, since he can get his fill watching the 54 sports at Auburn. He said that the Tigers are predicted to place last in the SEC and are in the same division of baseball powerhouse LSU, but Lonnie thinks they will be more in the middle of the pack since they have a new coach and he has a better plan. As I wandered around the stadium after talking to Lonnie I would hear him yelling, “Lets go blue”, or “Come on blue”. 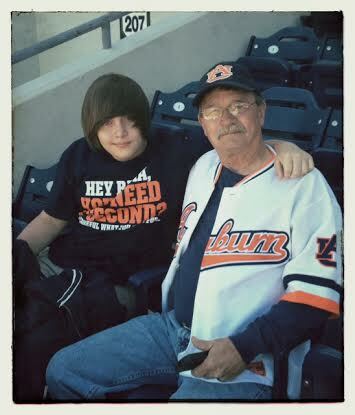 I loved the way he was when Indiana State got a base hit, he would say, “Just a long single”… Auburn beat Indiana State 4 to nothing in the first game of many baseball games to come, Lonnie you were the perfect “first” fan to interview for this new adventure I am on and I thank you and your grandson Noah for letting me watch part of the game with you. Go Blue! If you enjoy this story and you want to help me complete the “Baseball in America Tour 2014” which is roughly 265 days, please click on the following link to see how you can help http://www.baseballbuddha.com/sponsor.html. Please also share this on your Facebook page and Twitter, I appreciate all the help I can get! Lonnie the ‘ice breaker’! Not so much about baseball, but sport minded. With each that you approach, it will get easier and easier. 😉 This story is great!